Reverse micellar extraction (RME) is a promising liquid-liquid extraction technique for downstream processing of biomolecules from dilute solutions. An integrated approach of coupling RME with ultrafiltration is attempted to improve the overall efficiency of extraction and purification of bromelain from aqueous extract of pineapple core. The performance of RME is compared with aqueous two-phase extraction (ATPE), another potential liquid-liquid extraction technique and conventional ammonium sulphate precipitation technique. The reverse micellar system of cationic surfactant cetyltrimethylammoniumbromide/isooctane/hexanol/butanol used for RME resulted in an activity recovery of 95.8% and purification of 5.9-fold. The purification of bromelain increased to 8.9-fold after ultrafiltration. Alteration of aqueous phase pH during RME facilitated the differential partitioning of bromelain and polyphenoloxidase. Comparison of RME results with ATPE (activity recovery of 93.1% and purification of 3.2-fold) and the conventional ammonium sulphate precipitation (activity recovery of 82.1% and purification of 2.5-fold) indicated the improved performance of RME. The authors thank Dr. V Prakash, Director, CFTRI, for the encouragement and keen interest in the area of downstream processing. Authors wish to thank Department of Biotechnology, New Delhi for funding (No.BT/PR-6418/PID/20/259/2005) the project. Lakshmi, M. C., Madhusudan, M. C., & Raghavarao, K. S. M. S. (2009). Extraction and purification of lipoxygenase from soybean using aqueous two phase system. 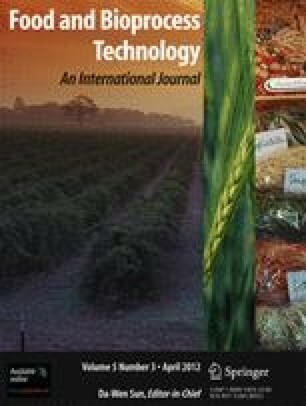 Food and Bioprocess Technology. doi: 10.1007/s11947-009-0278-8. Nandini, K. E., & Rastogi, N. K. (2008). Liquid-liquid extraction of lipase using aqueous two-phase system. Food and Bioprocess Technology. doi: 10.1007/s11947-008-0160-0.